Tampa, Fla. - The Tampa Yankees plan to Strike Out Cancer Saturday, June 6th, when they take on the Clearwater Threshers at 6:00PM. The gates at Steinbrenner Field will open promptly at 5:00PM. The night is sponsored by BayCare. 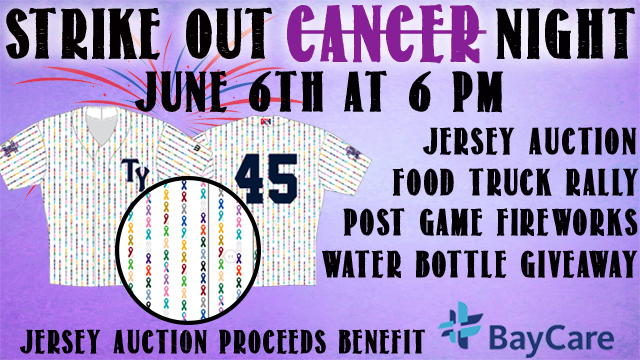 The Tampa Yankees players and coaches will be wearing custom made Strike Out Cancer jerseys that will be auctioned off during the game. Proceeds from the auction will benefit BayCare. The Tampa Yankees hope to encourage cancer awareness in the bay area, and to contribute as much as possible to cancer research and treatment. Fans are invited to come out to Steinbrenner Field early and enjoy a food truck Rally before the game. Trucks participating include Sarges BBQ, Disco Donuts, Kona Ice, Enjoi Sweets, PaniniRiffic, and Street Surfer. The first 500 fans to enter the stadium will receive a BayCare water bottle. To close out the night, there will be a fireworks display after the game sponsored by Sonny's BBQ. Strike Out Cancer Night is also a Friends and Family Saturday Sponsored by Tampa's Lowry Park Zoo. Fans can purchase Family-4-Packs which include four reserved tickets to the game, four hot dogs, four bags of chips, four sodas, four Tampa Yankees ball caps, and two passes to Tampa's Lowry Park Zoo for just $38. The Tampa Yankees invite all children 14 and under to run the bases from 5:00-5:15PM. Some of the Tampa Yankees players will be on the concourse signing autographs from 5:10-5:30PM. Individual game tickets are $4 for general admission, $6 for reserved seating and can be purchased at the George M. Steinbrenner Field Box Office or online through Ticketmaster. Parking for Tampa Yankees games is always free. The Tampa Yankees are the Single A-Advanced affiliate of the New York Yankees. For more information contact the Tampa Yankees offices at (813) 673-3055 or visit www.tybaseball.com.